Build your light pole banner by choosing the options below. Here in suburban Detroit, we offer local clients a comprehensive light pole banner service including banner design and production, permitting, hardware, installation, maintenance, and storage. 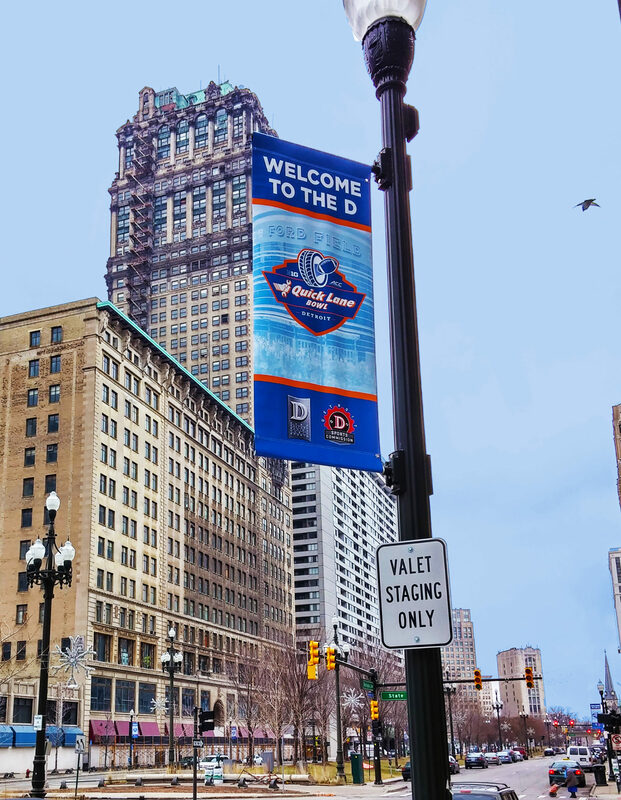 Directly below, we offer some feature products available for online purchase and invite you to scroll down to access our complete resource guide on implementing and maintaining a great light pole banner program. Note: Pricing below is for quantities up to five (5) banners. For larger quantities or custom-sized light pole banners, please call for details on our QUANTITY-BREAK pricing. Note: Any online pricing is subject to change and the prices listed here are production only. For permitting programs or installation service, please call and ask for a representative to discuss details..
Upload your files here, or via email to nicole@bannersignco.com. Be sure to include your order info such as invoice #, Personal/Organization name and contact information, and selected banner options in the message body. If you have questions regarding upload specifications, Please see our ARTWORK FAQ for upload suggestions and accepted formats. This ensures the greatest quality prints. 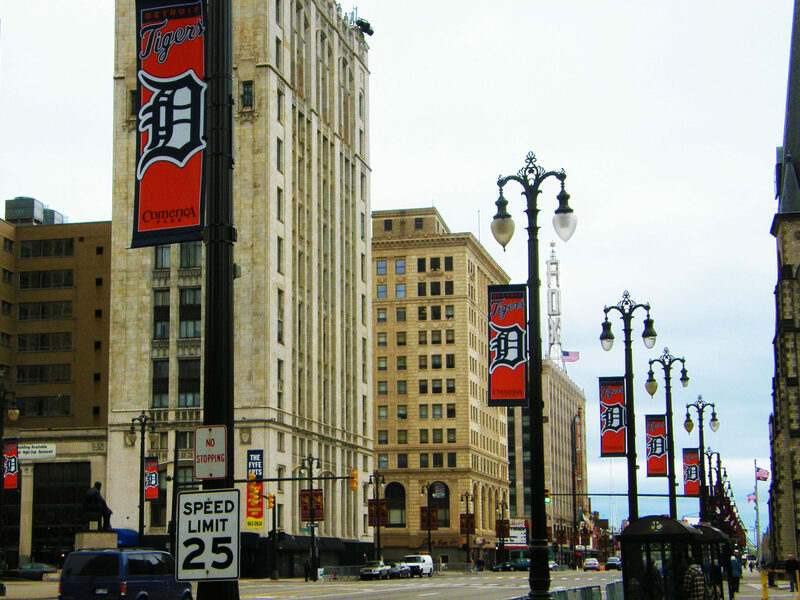 At Banner Sign Company, we’ve produced and installed thousands of light pole banners for a diverse client base. These range from Schools, Churches and Municipalities, through Pro sports teams, Shopping centers and Business parks. The one common element these groups share is that they rarely have anything in common. By this, I mean there are numerous variables to consider when purchasing light pole banners. So if you’re interested in learning a little more, please feel free to read on. How much do lighting pole banners cost? We hear this question a lot, but before I answer that, please consider your needs and give us some details so we can build you a custom quote based on your exact needs. Here are some basic things to consider. Please review the below sketch as you complete the checklist that follows. How many poles do you want to decorate (are they all the same)? Who owns the light poles and what are the permitting concerns? 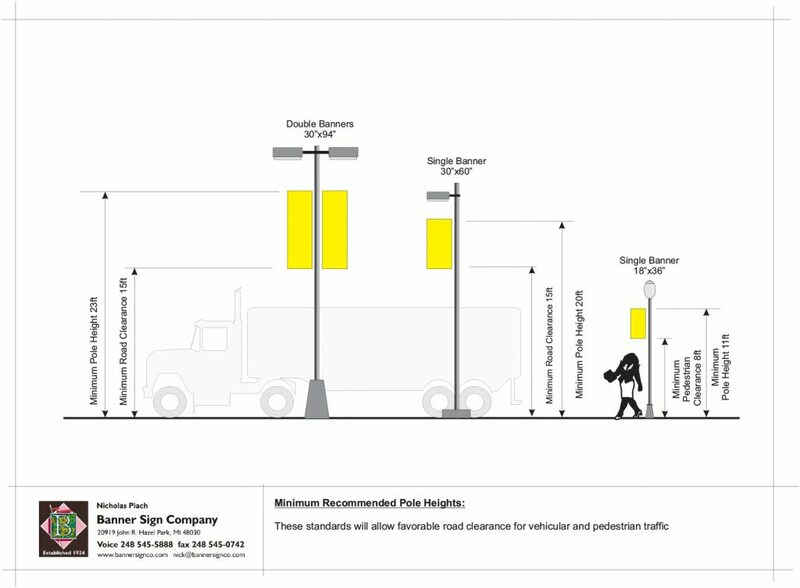 How tall are the light poles and are there collision risks? Do you have banner brackets? Do you want single or double banners? What size banners do you want? Is this a short term or long term display? Will you require installation and removal service? Thank you for reading our general information on Lightpole Banner Projects and I invite you to review our other information tabs or feel free to contact our office to discuss your banner project and get it to fly high soon! These are our most affordable full color banners which are ideally suited for short term applications in large format and smaller sizes (up to 24” x 40”) which result in minimal wind loads. The banners are constructed from a single layer of 18 oz opaque white material and printed two sides.Top to bottom pockets are simply folded and doubled stitched and the sides are not hemmed as a cost saving measure. The banner surface is somewhat rough due to the rugged scrim, resulting in good image quality. As an upgraded alternative to our Value Vinyl, these full color banners are recommended fro long term display and larger sizes measuring (30” x 60”). The banner are constructed from two printed layers of material and sewn back forming two Sided banner. 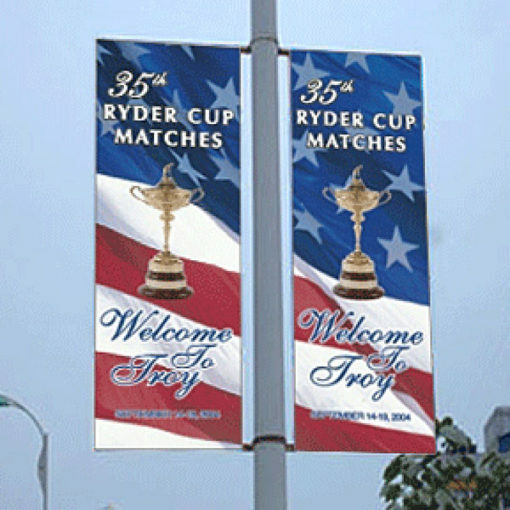 While the doubled layer material results in added strength , these banners are further upgraded with side hems ensuring maximum wind resistance. The banner surface is smooth rough due to the finder scrim, resulting in excellent image quality. For increased fade resistance , these banners can be upgraded to include protective laminate. widely known for there superior performance, Sunbrella banners are recommended for long term display in all sizes. The banners are screen printed in spot color and half tones. As such, they are not available for full color and high detailed graphic applications. Sunbrella banners are constructed from a single layer of material and are printed front to back. The pockets and sides are doubled rolled and sewn with mildew resistance twine. 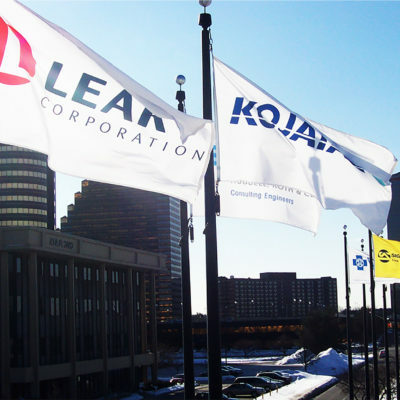 When properly installed the suitable hardware and maintained according to our instructions, these banners have can span upwards of 10 years in service life depending upon orientation toward prevailing wind and the amount of UV exposure. For eco conscious, short term applications with eye popping dye sub color, thru-prints will satisfy your needs at an affordable price. thru-prints are fabricated from a single layer of polester fabric and are finished with reinforced side hems, making them incredibly strong in all sizes. Using digital dye-sub technology, the banner are printed on side and heat set which forces the ink threw to the back side of the material, resulting in reverse reading image on back side. A reverse reading back side may be odd to comprehend at first however, our brains automatically transpose reverse reading image to be audible. Unlike solvent based vinyl printing, Dye-sub inks are aqueous based and are specially formulated to be environmentally friendly. Thru-Prints are a direct to substrate process and do not require the use of paper as an intermediate transfer as a medium typical to dye sub printing. Thru-Prints are an excellent alternative for two-sided applications. While traditional two-sided printing requires an image to be printed twice, thru-printing is a one hit process thus reducing ink and energy consumption by 50%. These brackets are recommended for indefinite permanent use. They are a two part system where a base casting is permanently mounted to the light pole and removable banner arm is installed to the base casting. The system ensures optimal banner tension under varying wind conditions. The key factor to ensuring long term service lies in how you mount the banner brackets to the light pole. For steel and concrete poles, we recommend using 3/4″ Stainless Steel Banding and buckles which are installed using a special tool to ensure optimal tension. For wood poles we recommend using Lag Bolts (3/8″ x 2.5″) and flat washers (7/8″ OD) which are available from your local hardware store. For temporary installations and smaller banners (Example HxW= 36″x28″) we recommend using our Economy brackets. Economy brackets are a one part system held to the light pole using screw gear bands. Stainless steel banding: This is a permanent method for installing banner hardware to steel and concrete light poles. 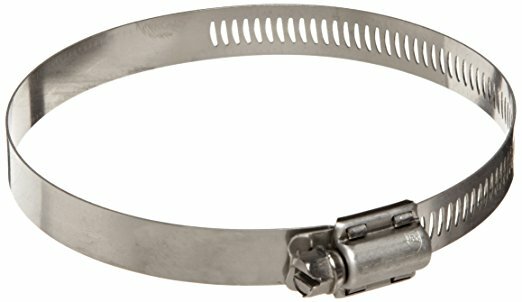 The banding system consists of 3/4″ stainless steel banding, specific buckles and a special tool for achieving optimal tension between the bracket and the light pole; all of which is essential to combating varying wind forces. This is the same system that Municipalities use for installing street lights and signs to utility poles. 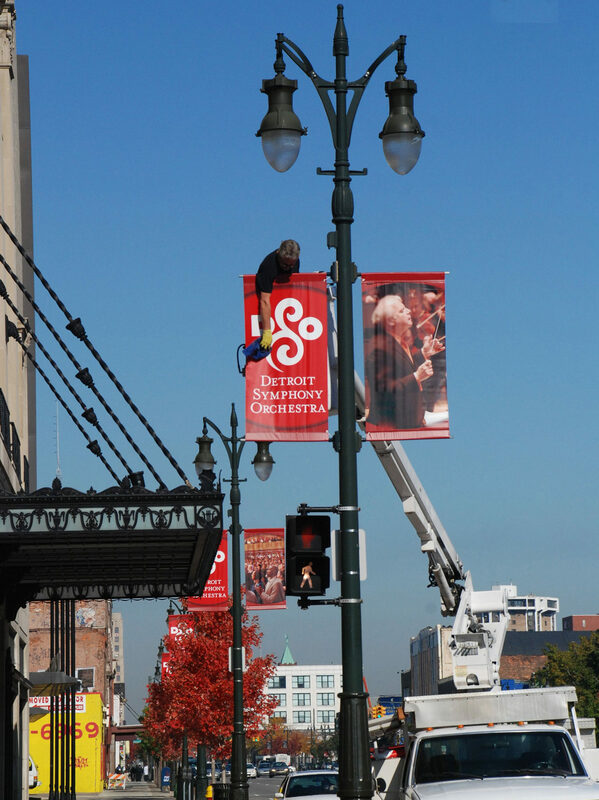 Screw Gear bands: This is a convenient method for temporarily installing banner brackets to light poles. For smaller banners (Approx (HxW) 36″x18″), screw gear bands will serve as a method of permanent installation. OK. Now that we’ve framed in your needs, we can proceed with a quotation. Directly below, I have compiled two quotations for clients that are starting from scratch. 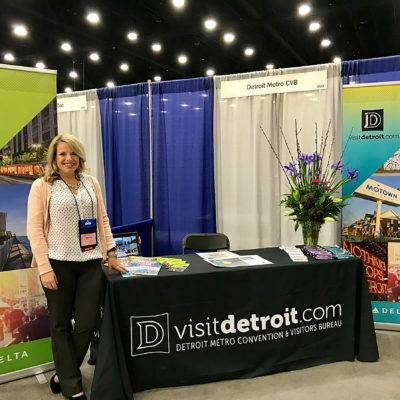 The first is for a long term banner display (Deluxe – up to 5 years), and the second is for a special event display (Economy – up to 1 year) like The Super Bowl. Both quotes are for 5) light poles with 24”x60” banners and the cost difference is in how we build the banner, the cost of the hardware and how long they take to install. 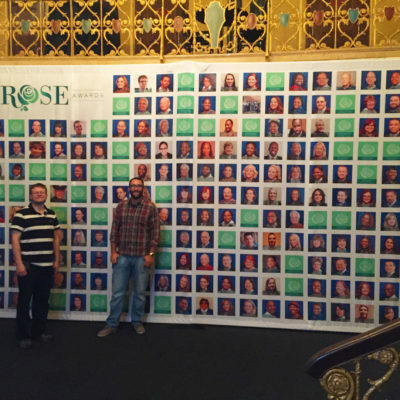 In both cases, the banners are printed front and back in full color. Both displays will look pretty much the same for the first 6 months and the economy display is more likely to start deteriorating after that time. It’s hard to put an exact time frame on the life span of an economy light pole banner because it all depends on the weather. However, it’s safe to say that smaller scale banners (24”x60”) experience far less wind loading than larger banners (30”x94”) and are likely to last longer. So, now that you have a ballpark cost, it’s time to consider permitting. The big question here is who owns the light poles? If they’re in your parking lot, not such a big deal but if they are owned by a Municipality or public utility, then you’re obligated to seek permission to display banners on them. 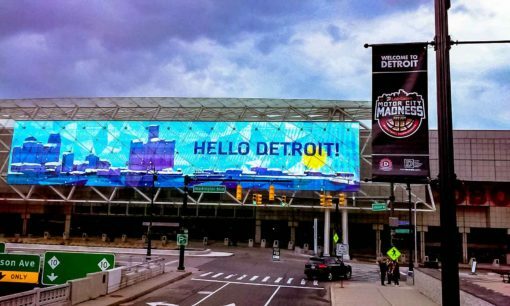 Light pole banner permitting will vary by Municipality, and while I can’t speak for all, I can say that it’s a serious consideration within The City of Detroit. 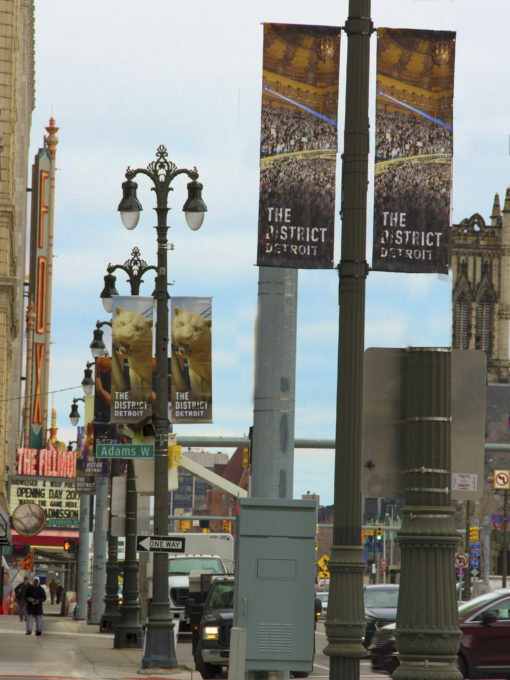 There is a well-managed ordinance that governs how banners are displayed on city-owned light poles. 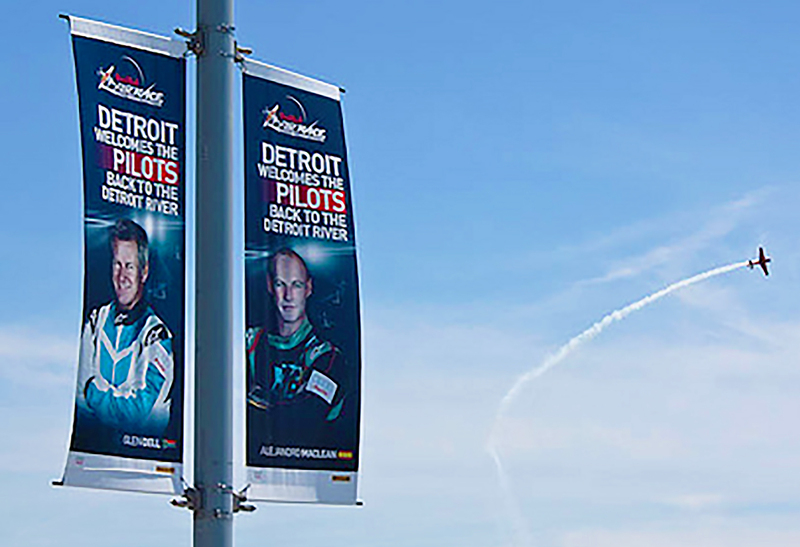 For information on Banner Permitting in Detroit, please see our information tab on that subject. On July 1, 2004, The City of Detroit implemented revisions to the above-referenced policy. The new policy has been well thought out, is carefully worded and should be given serious consideration prior to executing a banner project. 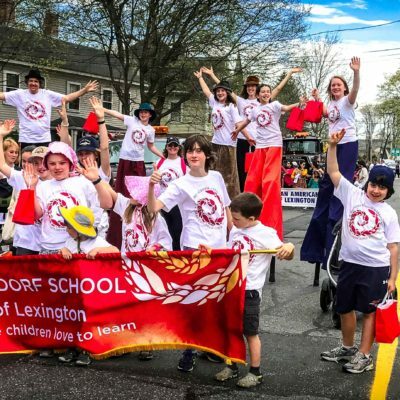 The following notes offer a brief consolidation of some of the policy highlights as well options that you may consider in determining how to proceed with your banner project. Application fee: $100.00 (non refundable). M-1 fee: $80.00 where applicable. Citizens can file for permission on their own behalf. Citizens can retain a banner company to file on their behalf. 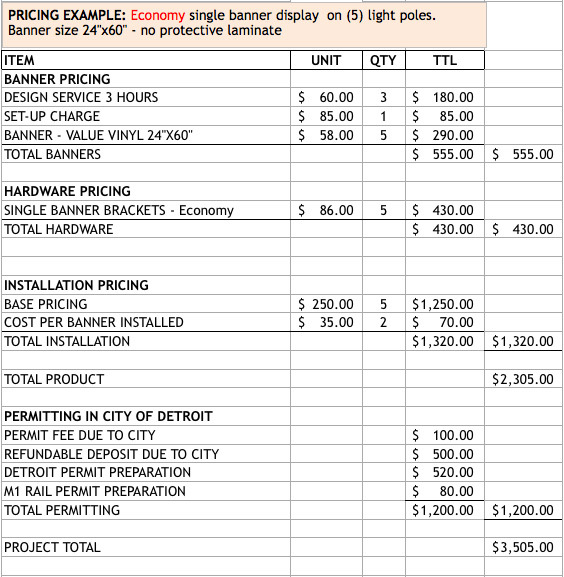 The following are options on how you may choose to proceed with your banner permit. #1: Proceed with a petition on your own behalf. Depending on your orientation toward securing permits, you may view the process as simple and straight forward. On the other hand, you may view the process as being complicated and confusing. It just depends on the individual. To execute the process, simply contact The City Clerks Office 313.224.3266 and ask them to send you a copy of the above-referenced policy. #2: Have Banner Sign Co handle the permitting process for you. We charge a flat rate of $520.00. Our fee includes a site inspection, a detailed map and permit preparation (application fees and deposits due to The City are additional). Our flat rate does not guarantee that your application will be approved and is non- refundable if it is not. Banner Sign has extensive experience in petitioning on our client’s behalf and have a successful track record for “getting it done”. In Closing, the above information has been provided as a service to our valued clients and we hope that you will find it informative. 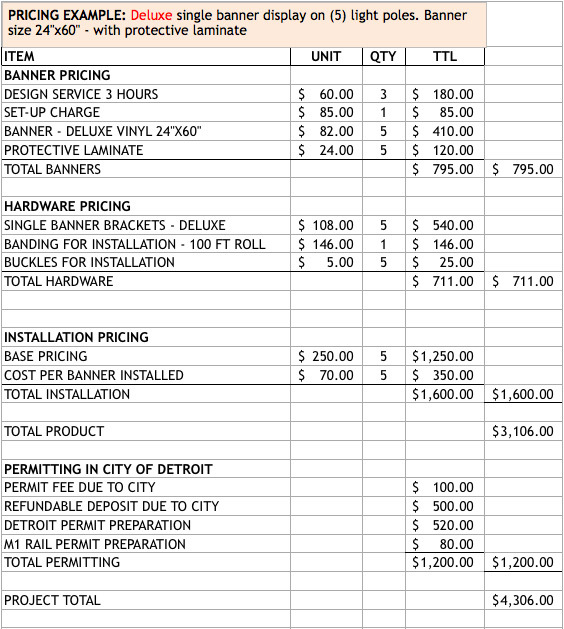 Should you wish to further discuss the matter of banner permitting, please feel free to contact our office anytime via email to info@bannersignco.com or phone at (248) 545-5888.